If you have a question about a specific position vacancy that you are interested in, please contact the Human Resources point of contact listed on the announcement. For more information about FWS job opportunities and employee benefits, please visit our FWS Human Resources page at www.fws.gov/humancapital/. You can also follow us on Facebook (www.facebook.com/usfws/) and on Twitter (@USFWS). Please share this message with other potential candidates and professional representatives who may have an interest in FWS opportunities. Thank you and good luck! We are excited to be recruiting an R3 fisheries biologist for the CT Department of Energy and Environmental Protection – Fisheries Division! Come join our team. The R3 coordinator position (at link below; closes March 11) is a Fisheries Biologist 1 position stationed in Hartford, CT. The selected individual will lead our angler recruitment, retention, and reactivation (R3) initiatives and general outreach functions. Of particular note is our strong interest in hiring someone that not only possesses all the skills and abilities we are seeking, but that is also fluent in both English and Spanish. The U.S. Fish and Wildlife Service (FWS) is sharing its current list of position vacancy announcements on USAJOBS. This list includes new vacancy announcements for mission critical vacancies from GS-5 thru GS-11. To view and apply for the specific FWS positions that you are eligible for, please click the following link (FWS Vacancy Announcements). On July 10, 2018, a grand jury charged Sommers with smuggling a package containing diamondback terrapins to Canada and several Lacey Act offenses for mislabeling the package and trafficking turtles domestically. Sommers pleaded guilty to one felony count of violating the Lacey Act and agreed to forfeit nearly 3,500 diamondback terrapin hatchlings. The Lacey Act is the nation’s oldest wildlife trafficking statute and prohibits falsely labeling packages containing wildlife, fish, or plants. Sommers acknowledged that he falsely labeled and trafficked turtles taken from their New Jersey marsh habitat from Aug. 7, 2014, through Oct. 24, 2017. According to the plea agreement, Sommers admitted to sending a package to Canada in 2014 containing 11 terrapin hatchlings. Sommers mislabeled the package as a book and underreported its value to avoid detection by customs authorities. Wildlife authorities from Environment and Climate Change Canada intercepted the package. Where? The Great State of Michigan has offered to host and we accepted the invitation. Benefits? The Prime salmon run is on, great fishing opportunities are available, and a tour with perhaps a hands on session taking eggs at the weir. This is your Conference! Be a part of it! Mark your Calendars today! RBFF’s 2018 State R3 Program Grants help fund state programs that are sustainable and replicable angler and boater recruitment, retention and reactivation (R3) initiatives and plans that focus on increasing fishing license sales and boat registrations to help achieve 60 million anglers in 60 months. The program is designed to support state R3 strategies that fall into one of two focus areas: (1) enhancing the capability of agencies to develop and implement effective angler and/or boater R3 efforts, and (2) implementing angler and/or boater retention or reactivation strategies to help increase participation to 60 million anglers in 60 months by utilizing RBFF’s Toolkits. Proposals are reviewed by RBFF staff and a Proposal Review Working Group, made up of industry Board members, Federal agency and NGO representatives. RBFF is no longer soliciting proposals for the 2018 State R3 Program Grants. The RFP for the next grants cycle will be available in 2019. Please view the 2018 State R3 Program Grants RFP and Application for current program information. Contact Stephanie Hussey, State R3 Program Director, with any questions. The Puerto Rico Department of Natural and Environmental Resources and the Department of Education signed a collaboration agreement. 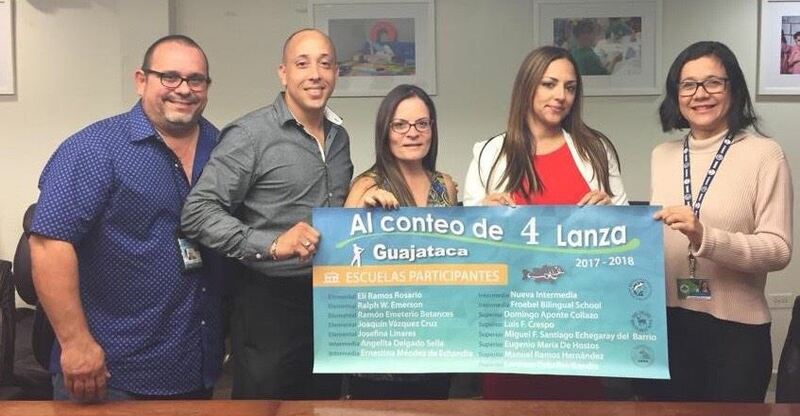 The agreement will facilitate the participation of Teachers and students in the Aquatic Resources Education Program activities organized to promote recreational fishing in Puerto Rico. The Aquatic Resources Education Program, as several other PRDNER programs, is sponsored by the Wildlife and Sport fish Restoration program of the United States Fish and Wildlife Service. The AREA Board voted to update AREA memberships. 1. Memberships will be in effect for a 12-month period from a new join date or a membership renewal date. 2. A new Organizational Membership level was established to allow an organization to register five (5) members at the price of four (4) which is $100. Each member has full voting status and other regular benefits. 3. The fee levels are: $25 for an individual 1-year membership; $10 for a retiree 1-year membership; $10 for a student 1-year membership; $100 for a 1-year organization membership (covers 5 individuals); and $100 for a 1-year sponsor membership (Biennial conference sponsorships are covered under the AREA Biennial Conference package).